Something Special - the world's first Barbershop Opera! by writing to Wallace De Pue, 5 Picardie Court, Bowling Green, Ohio 43402. Dr. De Pue also accepts commissions. Sets may be suspended from a clothes line by clothespins. The four "houses" should represent a house of straw, a house of wood, a house of bricks and Mother Pig's house, each painted on a canvas approximately 6' x 8'. The piano should be stage-right, nearly touching the set. A large box may serve as the piano bench. Another large box for props should be located stage-left. This opera is excellent for touring. Everything necessary to produce it can be contained in two large boxes and carried in an automobile. It has been performed over a thousand times in various schools. The True Story of the Three Little Pigs is published by Picardie Court Publications. Mother Pig is forced to send her children into the world to fend for themselves. Intent upon building a house, each of the three piglets chooses to explore a different direction. Upon completion of their dwellings, each piglet has an encounter with the Big, Bad Wolf. All vacate their homes and return to Mother Pig. To their dismay, they are tracked by the Big, Bad Wolf. The wolf tries to break into Mother Pig's house by ramming the front door. He is injured by a blow to the head. Amnesia sets in and he can recall nothing. The pigs persuade him that he is a bear. They send him "home" to Mrs. Grizzly's den. She is not pleased to receive him and says that he is really "for the birds." Convinced that he is a bird, the wolf tries to fly from a cliff and meets his demise. As the pigs celebrate the end of the wolf, they are interrupted by Mrs. Grizzly Bear. She pounds upon the front door and begs to enter. When the pigs refuse to admit a bear into their home, Mrs. Grizzly becomes hostile and promises to return with an ax. The pigs prepare to cope with their new problem. At the same time an opera story is unfolding on stage, a pianist is trying to present a formal piano recital on the same stage! He is surprised to find himself involved in the operatic action. Sometimes, he becomes engrossed in what is happening and provides appropriate musical accompaniment. The simultaneous activities of opera and recital finally merge with the moral of the story: "Sometimes, a problem can seem to last for an eternity"! Will Miss Piggy sue Wallace De Pue, the composer/author of “The True Story of the Three Little Pigs,” which received its premiere performance Thursday evening before a laughing, applauding audience at Bowling Green State University’s Moore Musical Arts Building’s Kobacker Hall? 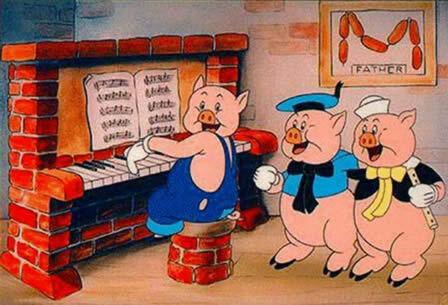 BGSU music Prof. Wallace De Pue, wanted to set the story of “The Three Little Pigs” straight once and for all, to wit, “it is the true story of what really happened – according to me.” The opera (comedy, farce, satire, and so on) was two years in the making, in response to a facetious challenge by faculty colleague Andreas Poulimenos, who ended up with the lead of the big, but not so bad, wolf. In fact, the way he did the wolf, I would prefer him as a pet in preference to the overzealously trembling, fainting and squealing piglets anytime. What De Pue has done is to extend the story to the moral: Solve one problem, and another follows. And he complexified the doings with a concert pianist on stage who tries to play a recital but naturally gets involved in the on-stage shenanigans and with some of the truly best comic bits of the 50-minute production. De Pue never does the expected. He has a fine ear for tunes and styles which he merges into a rich pottage-melange collage, from melody to speak-music, jazz to country, pop to barbershop, and beggings and borrowings, with tongue in cheek, of course, that included a waltz, an operatic quartet, Gilbert and Sullivan, and you name it, chances are it’s in there somewhere. 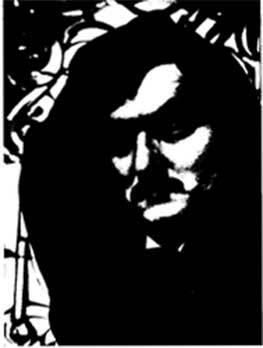 De Pue achieved success with his 1974 opera “Dr. Jekyll and Mr. Hyde” – Poulimenos sang the role of Mr. Hyde -- and his barbershop-style opera “Something Special” in 1976. He has a way with a tune, orchestrates well, and writes fluently and tunefully. He can poke the subtlest fun at musical style and form, as the nonspeaking pianist – Walter Baker was just perfect in the role and hammed it up with taste – demonstrated with original (sic) pieces credited to Felix Earl Mendelssohn, Frederic Chopin Wallace, Franz Wallace Schubert, Johannes DeBrahms, Franz Pue Liszt, and Wallace Earl De Pue, in case you didn’t catch on right away. The show is lots of fun, even if it isn’t altogether original – several composers have done these admixtures before – but when done with a grin, they can be lots of fun, and this one was. 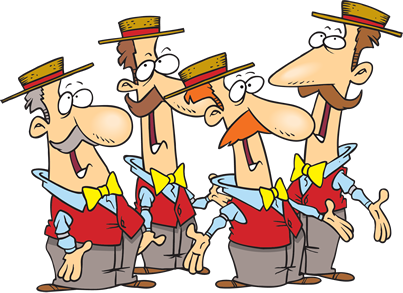 If you didn’t like the chorus line stepping, you could always enjoy the PorkChop (Barbershop) Quartet (ugh!) by Mother and her three-pig brood or wait for the rhythm-speak spelling bee. Faculty member Barbara Lockard’s mezzo sounded fine as Mother Pig and she, like Walter Baker, was a a good sport and joined in the fun and slapstick. But the crown goes to the Big, Lovable Wolf of Andreas Poulimenos, who huffed and puffed and cried and sang up a storm. His baritone carried the role even if he jumped and grabbed and scratched and whined and howled and postured and strutted with abandon. The three pigs were “in the mood,” perhaps even a little too much so at times. Everything in the presentation clicked, even if sometimes I was never sure whether this was a kid’s play or a lesson for adults. Let it be both. I can hear the composer say. But I did not care for the facial makeup of the pigs and the wolf; they were hideous, when they should have been if not realistic at least pleasant. For at the end – remember Prokofieff’s “Peter and the Wolf”? – the “angel” wolf, having suffered his demise, returns to join the pigs for a go-around. A lark to be enjoyed, rated CF, i.e., clean fun, and so it was by all and sundry, the little ones and the bearded elders as well as by yours truly, alas beardless. But why only one performance? An all-student cast is to take the show to schools, I understand. Well and good, but the comic opera deserves lots more hearings before adult audiences as well. Any chance for a reprise next season? Opera duration: approximately 2 hours and 30 minutes. Concert version: 50 minutes or less. The first set should depict the trees in the forest. The second set should depict a clearing where the human food shed stands. The third set should depict a place where the home of the witch is located. The fourth set should depict an office for Erutan Smith. The fifth set should depict the garden outside the house of the witch. There is a recording of several of the opera songs available for perusal. The musical score (libretto included therein) is available through Wallace De Pue, Sr.
Erutan Smith introduces himself to begin the story and to act as a representative for progress. E-R-U-T-A-N is "Nature," spelled backwards. He is aware that this story is about nature and is afraid that if the story is too successful, progress and the business world might be threatened. Freddy and his sister, Fredena, have moved to a new home in the country. When they go out to explore their new neighborhood, they are surprised to find that the creatures of nature are terrified. A willow tree tells them of a monster who breaks tree branches, tramples little saplings and peels off tree bark, just for fun. The willow has never seen him, but says that a witch, who lives near the town of Oz, has his picture. The tree's story makes the children so angry that they resolve to find and subdue the monster. Freddy and Fredena find a small pond and prepare to quench their thirst. As they draw near, a bubble in the pond warns them not to drink, because a monster has poisoned the water and has thrown filthy items, and bottles containing chemicals into it. The bubble assures the children that the monster is quite near and that a local witch has the culprit's picture. The children promise the bubble that they will hunt down the nasty monster who has robbed them of their privilege to drink fresh water from the pond. As Freddy and Fredena renew their search, a peculiar wind begins to blow dirt and dust all over the place. Out of frustration, they complain about the wind because they have begun to cough and sneeze. They are amazed to hear the wind reply to what they say. They find it incredible to learn that, because of smog, the wind has lost track of which direction to blow! The children tell him of an awful monster who is probably responsible for polluting the atmosphere with smoke and fumes. The wind becomes angry because the monster may have damaged the ozone layer that protects Earth from the sun's rays. The wind doesn't remember ever having blown over the witch's house, so he cannot provide the children with directions to her home. He is unable to take a holiday and join in the search for the monster because terrible things might occur on the planet during his absence. The children make a strong commitment to the wind. They promise to seek out and capture the terrible monster who has contaminated the air that people breathe. Freddy and Fredena encounter a parrot who leads them to a place where there are several birds being tended by an old eagle. All of the birds are languishing, apparently ill. The children inquire as to why the birds are not flying, as birds should, and why they are all just lying around. The birds do not know what is going wrong. Freddy and Fredena tell them of a monster who has poisoned fish and plants that birds eat, and furthermore, that the fiend has even trapped some birds with crude oil, so they could not fly after landing on water. The eagle tells the children that produce from the ground is so toxic that some birds and animals who eat it grow sick and die. Upon hearing this, the children are furious; they rededicate themselves to doing away with the monster. Since the birds were usually high in the air when the monster struck, they had never observed him at work. Still, they know he could not be too far away. They also know of the witch who has his picture. Their bird's-eye-view of the land enables them to reveal the exact location of her house. With a squadron of birds guiding them, the children find the witch's place. There are large stone sculptures in her yard. Freddy and Fredena watch from a hiding place as she works, hammer and chisel in hand, on some of her statues. Fredena continues to hide but Freddy approaches cautiously and calls: "Miss Witch!... Miss Witch!" 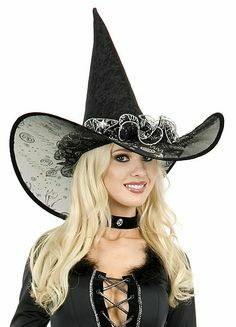 Until Freddy met "Miss Witch," he believed that witches were fierce and ugly. To his utter delight, the witch is a jolly, effervescent woman who is friendly and ready to help when Freddy asks to see a picture of the monster. Even though she agrees to let him see it, there is a condition: he must promise to work with her toward the monster's complete demise, and be under her command in case a united effort is needed to stop the creature. Freddy agrees, enthusiastically. The witch leads him to a huge picture frame completely covered by a cloth. She asks him to confirm his promise to arrest the monster. Freddy renews his vow and then the witch withdraws the cloth. Instead of a picture, Freddy sees the image of himself in a mirror! He, and his kind, represent the monster who torments all living things! The witch is charming; so even though Freddy is puzzled, he complies with her request to assume a number of peculiar poses. When he questions why he is posing, she tells him that he has to make good his promise and work with her toward the total demise of the image in the mirror, the monster. She states that, since she intends to cast a spell that will turn him to stone; she wants a special pose to distinguish him from the other statues she has in her yard. Just as the witch raises her wand to create a "stone Freddy," Fredena, who has been listening to everything from her hiding place, reveals herself and pleads for her brother to remain unchanged. She explains to the witch that he, too, wants to stop pollution. That, in itself, should prove that all humans are not monsters. Although it makes reasonable sense to the witch, she decides to execute both Freddy and Fredena, just to make sure that they are not monsters in disguise. As the witch slowly raises her wand to immobilize Freddy, his sister reveals, quite by chance, that she knows Erutan Smith. The witch is very interested in the whereabouts of Erutan Smith and promises to let Freddy and his sister go, if the children can help her to capture him. Freddy and Fredena are told that, as long as Smith is around to lead the monsters in their attacks, she will respond in kind, and plague all human beings with insects, blizzards, tornadoes, tidal waves and earthquakes. Because of the witch's resolve, the children promise to deliver Erutan Smith to her by trickery. They assure the witch to consider it done. Erutan Smith receives a free photography coupon in his mailbox. He is most interested in meeting the strange lady whose likeness appears on the coupon. He recalls how she had gone out of her way to take his picture during lectures that he had delivered regarding progress. Thinking that she must be a dedicated fan of his, Erutan Smith makes an appointment. Easy to follow directions are drawn on the coupon. On the day when Erutan is supposed to have his appointment for a portrait of himself, the children and the witch have all of their forces ready to capture him. The trees lie in wait ready to snag him if he tries to escape through the forest; the river's water is running high and fast, in case he tries to cross it; the wind is howling and threatening a tornado; and the birds are ready to attack him from the air if he tries to leave. The witch charms Erutan into allowing her to do his likeness in stone. He is delighted with the prospect and succumbs to her suggestion to pose among the statues in her yard. He revels in the attention, and assumes a number of trial poses before the witch suspends him with her magic wand. All of the creatures Erutan has tortured reveal themselves and are on hand when he faces his solemn demise as the witch speaks the final word, "Abracadabra". Dr. Jekyll and Mr. Hyde is available through contacting Wallace De Pue, Sr. Although Henry Jekyll has acquired great wealth, fame and respect through his practice of medicine, his compulsion to explore forbidden regions of knowledge has estranged him from some of his most distinguished colleagues. Still, he has continued to experiment until he has developed a potion that he believes will unlock the door to man's second personality. It is his contention that each person is not one being, but two! Because Dr. Jekyll is a man of compassion and honor, the final experiment can only be tried on himself. After drinking the potion, his evil self, Mr. Hyde, appears. He bears no resemblance to Dr. Jekyll. Mr. Hyde pledges to taste every form of evil, and begins by assaulting and trampling a child. He is caught in the act and forced to implicate Dr. Jekyll. The incident comes to the attention of Gabriel John Utterson, Dr. Jekyll's best friend and legal counselor. Mr. Utterson is certain that Dr. Jekyll is in danger, so he begins to investigate Mr. Hyde. There is a confrontation between the two men, and their meeting puts Mr. Utterson in a state of complete confusion. He cannot believe that his friend, Dr. Jekyll, has made a legal will leaving everything to Mr. Hyde. Dr. Jekyll is so appalled at Mr. Hyde's escapade involving the child that the doctor is determined to abstain from drinking the potion again. In an effort to reacquaint himself with his friends, he invites them to a party where he serves as host. He feels the presence of Mr. Hyde trying to overcome him, and separates himself from his guests just before the change takes place. By chance, Mr. Hyde encounters a member of Parliament on a dark street and commits murder. When the police investigate, they find a broken walking stick beside the old gentleman. It was a clue. The police ask for Mr. Utterson's services to identify the body. Mr. Utterson recognizes the broken cane as one he had given to Dr. Jekyll as a gift. The police tell him that a chamber maid witnessed the murder from her window, and they describe Mr. Hyde. Mr. Utterson pays Dr. Jekyll a visit, believing the he can learn the whereabouts of the culprit. Dr. Jekyll presents a letter that declares Mr. Hyde never intends to reappear. It is signed by Mr. Hyde. Dr. Jekyll thinks Mr. Hyde would not dare overcome him and face execution as a murderer, so he invites all of his friends to the wedding of one of his patients. He acts as host at the wedding reception. After the reception, he is terror-stricken when, without taking the potion, he senses Mr. Hyde reappearing. After Mr. Hyde has assumed Dr. Jekyll's identity, he believes he has been tricked. Dr. Jekyll does not mean to return to his true identity! At first, Mr. Hyde implores Dr. Jekyll to come forth and save him from being hunted and executed. Finally, he realizes there is a way to force Dr. Jekyll to come forth. He promises Dr. Jekyll that his last appearance as Mr. Hyde will be one to remember. Mr. Hyde appears in a low-class pub in the slum district. He is entertained by a prostitute named Lily Belle Lorraine. Mr. Hyde becomes the essence of crude charm as he pursues Lily with the encouragement of all the people in the pub. Although Lily is repulsed by Mr. Hyde's appearance, she takes him to her private room just to save face. The people in the pub are overcome with fear when they hear her terrified screams as she is being murdered. Although there is a manhunt for Mr. Hyde, the police are unable to find him. Mr. Utterson receives a summons to Dr. Jekyll's house from Mr. Poole, the butler. When Mr. Utterson arrives, he finds the servants huddled together in fright. Mr. Poole explains that he believes Mr. Hyde is locked in Dr. Jekyll's laboratory. No one can explain how Mr. Hyde entered. The voice of Mr. Hyde can be heard moaning and crying from within the laboratory. Mr. Utterson decides to knock down the door. Mr. Poole strikes the door with an ax as the voice within the laboratory pleads to be left alone. As the door falls, Mr. Hyde swallows a vial of deadly poison. The servants believe that Dr. Jekyll has been murdered and that he is hidden somewhere on the estate. A complete search of the premises is made, but to no avail. Mr. Poole concludes that Dr. Jekyll must be hidden in the laboratory where the body of Mr. Hyde was found. Mr. Poole goes into the room, by himself, to investigate. The servants are horror-stricken when they hear Mr. Poole's cry from within the laboratory. As he appears at the doorway, Mr. Poole pleads for everyone to leave and not witness what he has seen. He tries, in vain, to quell the curiosity of those present, and the opera ends as everyone goes into the laboratory to see what has so frightened Mr. Poole. He pleads with everyone that they should enter the chamber and see what he has witnessed. Here is an MP3 audio recording of a performance by faculty and students of Bowling Green State University Click on the links. your computer should play them. In 2014, Something Special won the "Gold Medal" (First Prize) in a worldwide competition sponsored by the Boston Metro Opera. There were 625 works, from six continents, submitted. The first set should depict the basement of the Frotheringslosh Tavern. 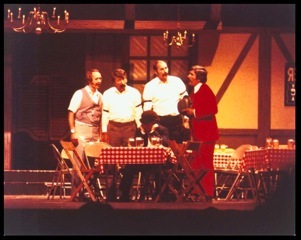 The second set should depict the interior of the Frotheringslosh Tavern. There is a color VCR recording of the entire opera available for perusal. The musical score and libretto are available through Wallace De Pue. "If Angels Know How to Cry..."
The four Frotheringslosh brothers, owners of the tavern in the town, experimented with a secret beer formula that was concocted by their great-grandfather. When they first realized the formula, they were aided by a friend named Jack. Although the directions stipulated that the color must possess a golden hue, that the bubbles create a tinkling sound, and that the foam be on the bottom; Jack had imbibed the brew before all things were in effect and had begun to shrink in size. The brothers, determined to save their friend from shrinking to nothing, reconstructed the formula hoping another drink would restore Jack to his former self. The notes left by their ancestor stated that the brew was "something special" and that remarkable things would happen to all consumers. Before the brothers offered another drink to Jack, they tested the formula on animals. They were certain that the mixture was correct after an alley cat drank some of it and began to roar like a lion. It leaped through a twelve-foot-high window to make good an escape from the tavern basement. Still, the brothers felt compelled to make at least one test on a human being before approaching Jack with the revised formula. "Dirty Tim Corlette" was an unattached derelict who frequently amused the tavern customers in his attempts to freeload. He was chosen as the ideal subject for the brew's "human test." The Frotheringslosh brothers enticed Tim to drink their sinister beverage and were utterly amazed at the results. The anemic hobo turned from "Dirty Tim" into "Gentleman Jim" Corlette, the man who eventually wrested the title of Heavyweight Boxing Champion of the World from the almost invincible John L. Gullivan. An even more amazing thing happened to Jack after his second experience with the "something special" brew. Comment from Barbershop HQ website "...a jaw-dropping show"